The internet's oldest casino software developer has been in business since 1995 and offers over 400 different casino games to players. Casinos on the Microgaming progressive jackpot network have paid out over $280m and created 14 millionaires. Microgaming is the internet's largest online casino software developer and have been in business since 1995. They are based in South Africa and provide the software to over 120 online casinos. Their selection of slots is second to none, and their stable includes some of the most popular branded slots like Tomb Raider, Hitman and The Osbournes. The Mega Moolah progressive jackpot game is the biggest online slot jackpot to ever be won, having paid out a prize of $5.5 million previously. 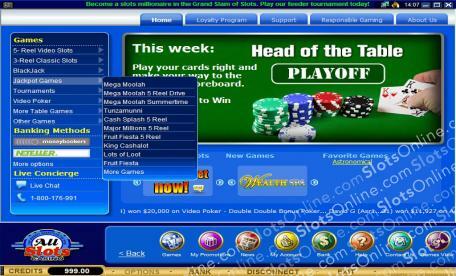 Many of the internet's most trusted online casinos use Microgaming software to run their games. 32Red and All Slots are our favorite Microgaming casinos, but all of the brands listed here at SlotsOnline are great to play at. There are many slots tournaments available at Microgaming casinos. All Slots has more online slot games that any other casino, and the biggest progressive jackpots and slots tournaments - it really is the best choice for slots players! If you're looking for an online casino with a massive selection of slots, look no further than Spin Palace. Not only are they offering over 200 games, but they're also offering a sign up bonus worth up to $1,000! Check out our review of Roxy Palace Casino to find more information about this great online casino. You can play for fun or real money. Download their free software or try out their instant play flash version for hours of gambling fun!